The 88th Milan-San Remo started on a cool and sunny morning. Germany's Erik Zabel won the 294 km Milan-San Remo Classic after World Champion Johan Museeuw and World number one Laurent Jalabert were involved in a bad crash in the closing meters. After aggressive racing leaving Milan the first successful breakaway went at the km 98 mark. The four rider group included Zanette, Molinari, Poli and Pieri and gained a 4'26" maximum advantage by 136 kms. The breakaway’s lead began to fall and the final three escapees were caught just before the Cipressa. Rolf Sorensen led the strung-out peloton over the top of the Poggio. The elite groups rejoined the leader on the descent as the race flew into San Remo. Zabel’s Telecom team drove the pace onto the Vis Roma and launched the German to the sprint. 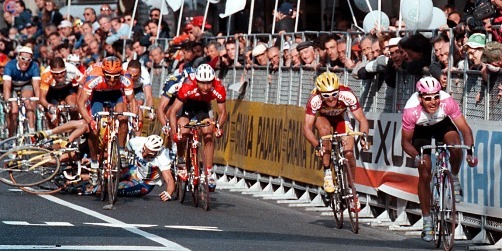 As the powerful Zabel crossed the finish line for the easily victory. Laurent Jalabert appeared to ride into Johan Museeuw, sending both to the pavement and bringing down several other riders. 1. Erik ZABEL (Ger) 6h57'47"